Special Ops soldier Griffin Reid doesn’t exactly have happy memories of growing up in Sunshine, Idaho. He’s only come back to recover from a war injury, and while he refuses to admit he’s in a weakened state, he finds comfort in the last person he’d expect. 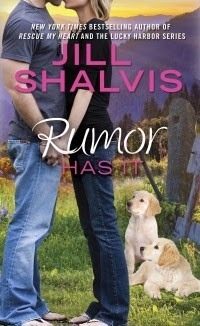 This book is part of the Animal Attraction series, and I think it is my very favourite series by Jill Shalvis. Rumor Has It is another excellent book in the series and I enjoyed it. I liked Kate very much, and her being a teacher added that little piece of interest to it for me. Griffin was a rather intense character with a back story of his own that added interest to the book. Kate is the family mainstay. Her mother has died and she keeps an eye out for her Dad who has not coped all that well, her sister Ashley - a teen, and her young brother Tommy who always insists on being either one hero or another. She has the opportunity of a year's study in Science away from the area, but believes her family won't cope without her. We all believe to some extent that we are our own versions of the Greek god, Atlas. Part of this story is the tussle Kate has with letting go and choosing something more. As I began this book the first thing I noticed were the sentences. They were so nicely varied and fluent. Normally I take this for granted in a published book, however I had just come from reading a book where the sentences just did not have that fluency. I had spent time rearranging sentences, thinking - they could have been made more interesting this way. With Rumor Has It, after appreciating the first page and the fluency of the sentences, I sunk gratefully into the book and enjoyed the story and the characters!